478. Day 1 - Milan | LEFTBANKED. I'm currently at my hotel in Milan..as you know, I had a long journey over. I felt/feel extremely sick today so right after I post this I'm going to head straight to sleep. I really want to do frequent updates, at least once a day, so I couldn't miss tonight even if I am typing this with a pounding headache lol. In the past when I would mostly post about my trip after I got back to Toronto, it didn't seem as authentic and interesting to read (I would assume). I actually got a bit sick a couple days before coming here..then I think the long travels made it much worse. It was a combination of lack of sleep + lack of food + sore throat/cold + EXTREME turbulence. Actually I might've been ok if it wasn't for the plane turbulence on the way over from Frankfurt. I don't know if that was normal. At one point our plane shook and fell down so much we literally all flew up off our seats a few inches and some people screamed. I'm really not exaggerating either. It was sooo scary. I experienced that only once before that I can recall - last year when I went to HK so I don't know if that was normal.. I was feeling fine (apart from a sore throat and runny nose) until then. Then as the plane was landing I got a huge headache and felt like throwing up. I didn't though but from then on until now, I've felt that way (on the taxi over from my hotel, I even had to ask the driver to stop in between so I could take a walk outside before continuing on). He also had trouble finding a street to my hotel. So the drive was double the time it should've taken. Anyways I checked into the hotel, got changed and freshened up a bit. Walked out to see I am literally right beside La Rinascenete - a luxury department store. So I went in and immediately got my new Givenchy bag! I have to say the salespeople in there were not really friendly. I should've just gone to the main boutique for it. 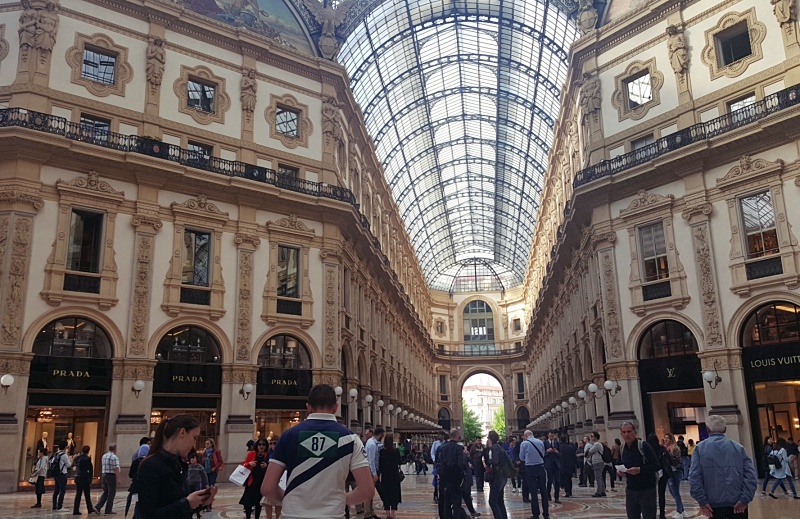 Then found out one of my credit cards got frozen for security reasons..(luckily I had another that worked), so after getting back to the hotel and sorting it out again, I went for a walk around the Duomo and Galleria Vittorio Emanuele. My hotel is located right beside so it was a quick walk. Then it suddenly began to get really windy and cold, so I didn't stay out long. Ended up back at La Rinascente's restaurant for my attempt at dinner. I say attempt because I ordered it but only was able to have a few bites before I felt sick again. So I asked them to pack it for me and I took it back to the hotel..ended up taking a nap for a few hours. Woke up and still felt sick so I took a bath. Worked for a bit. & Now I still feel really sick so I'm going to sleep and reallyyyy hoping the rest of the trip will be better. I'll try to post a full photo post tomorrow and will update again so check back! Hey! Don't feel that you wasted your time, you were sick after all~! But kudos to still being able to buy your bag hahaha Can't wait to see it! I think you're right about travel posts that are written after arriving home, you just can't remember every sigh, sound, and feeling that you were experiencing at the moment. I usually have a daily "journal" I write in my [phone to remind myself of what I was thinking or feeling at the time. I also use it to write down cool facts that I want to remember. I hope your flights only get better from here on out! Today I felt better..still have a sore throat though but I did manage to explore a lot of the city. Yea exactly! I used to write a travel diary in my moleskines (I would get one for each trip and even stick receipts, ticket stubs, etc all in there) but then writing by hand took too long since I write so much..so I got lazy with it lol. It's way more convenient to just type/blog it.